Well established as a leading California photographer, Eadweard Muybridge made the first of his motion sequence photographs in 1872, on commission from Leland Stanford. According to legend, Stanford had made a wager that a horse trotting at full speed had all four feet off the ground at certain times. Muybridge was able to capture silhouette images of the horse in stride, proving Stanford correct. In 1877, Muybridge began further experiments for Stanford with a battery of 24 cameras and a system of shutters activated by threads tripped by the moving horse. In 1882 the results of these studies were published in a volume titled The Horse in Motion. 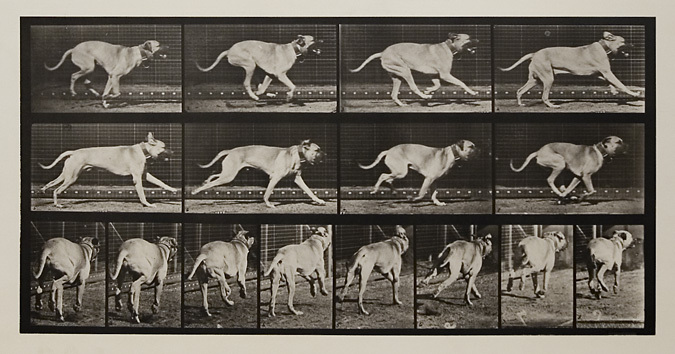 Beginning in 1884, the University of Pennsylvania sponsored Muybridge’s extensive project of photographic studies of animals and humans in motion. A selection of 781 collotype plates was published in 1887 under the title, Animal Locomotion. 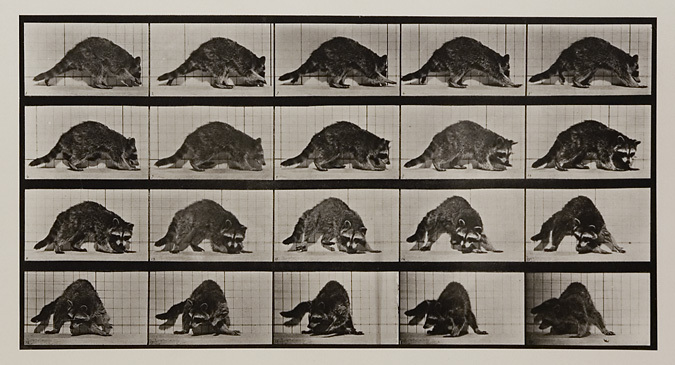 Muybridge created a devise for animating his still images in 1879 and called it the Zoöpraxiscope. Today he is recognized as one of the pioneers in the development of the modern motion picture. Cockatoo flying. Plate 758 from Animal Locomotion, ca. 1887. Vintage Collotype, printed 1887. Image measures 8 x 14 1/2 inches. Inventory #MU038. Cockatoo flying. Plate 760 from Animal Locomotion, ca. 1887. Vintage Collotype, printed 1887. Image measures 8 3/4 x 12 3/4 inches. Inventory #MU039. “Smith” aroused by a torpedo. [Dog]. Plate 714 from Animal Locomotion, ca. 1887. Vintage Collotype, printed 1887. Image measures 5 x 18 inches. Inventory #MU018. Virginia dear, buck, galloping. Plate 683 from Animal Locomotion, ca. 1887. Vintage Collotype, printed 1887. Image measures 8 x 14 3/4 inches. Inventory #MU019. Elk galloping, irregular. Plate 694 from Animal Locomotion, ca. 1887. Vintage Collotype, printed 1887. Image measures 8 3/16 x 14 1/8 inches. Inventory #MU022. Antelope trotting. Plate 697 from Animal Locomotion, ca. 1887. Vintage Collotype, printed 1887. Image measures 8 5/8 x 13 3/4 inches. Inventory #MU023. Lioness walking. Plate 728 from Animal Locomotion, ca. 1887. Vintage Collotype, printed 1887. Image measures 7 5/8 x 14 3/4 inches. Inventory #MU027. Bactrian camel walking. Plate 737 from Animal Locomotion, ca. 1887 . Vintage Collotype, printed 1887. Image measures 9 5/16 x 12 7/16 inches. Inventory #MU034. Raccoon walking and turning around. Plate 745 from Animal Locomotion, ca. 1887. Vintage Collotype, printed 1887. Image measures 7 3/4 x 14 7/8 inches. Inventory #MU035. Two elephant walking. Plate 734 from Animal Locomotion. ca. 1887. Vintage Collotype, printed 1887. Image measures 6 1/4 x 18 1/4 inches. Inventory #MU032. American eagle flying. Plate 769 from Animal Locomotion., ca. 1887. Vintage Collotype, printed 1887. Image measures 6 3/4 x 17 3/16 inches. Inventory #MU040.